Illustration Stats - Size: 36" @ 350 dpi, 640 mb CMYK File with 35 Layers / Illustration Time: 720 hrs. With all of the line art complete, it was time to move on to the color phase. The line art was exported from Illustrator into Adobe Photoshop CS. At this point in the project, photo reference started to come in. 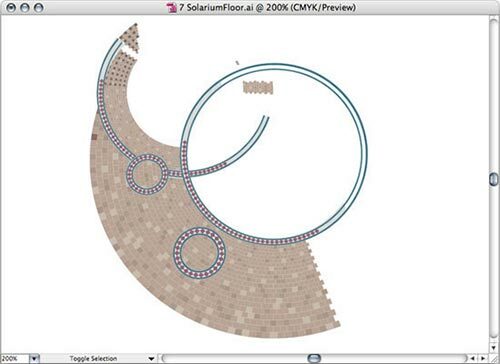 The first step was to duplicate all of the floor coverings in "plan" view. 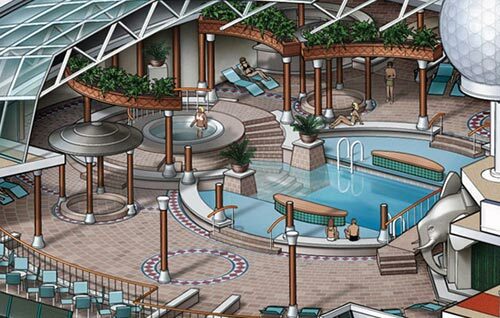 The following image is the tile floor of the ship's Solarium. 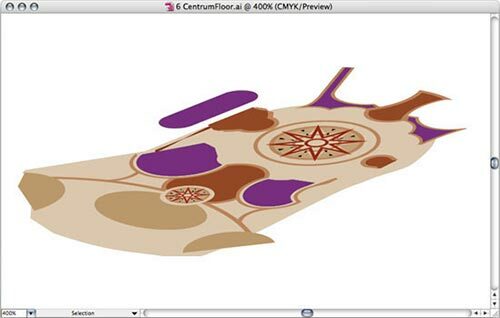 All of the hard floor surfaces were created in vector. These Adobe Illustrator vector files were distorted into the correct perspective of the main illustration using Illustrator's "Free Transform" tool, then they were exported into Adobe Photoshop. 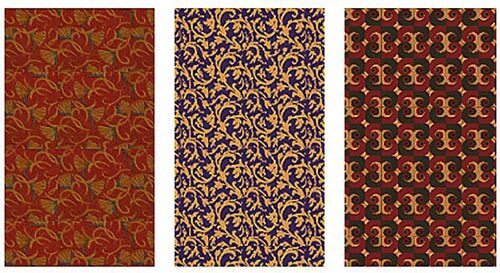 The carpet patterns were created in Adobe Illustrator or Adobe Photoshop working from client supplied carpet samples. Carpet texture was created with the Photoshop CS "Noise" and "Blur" filters. 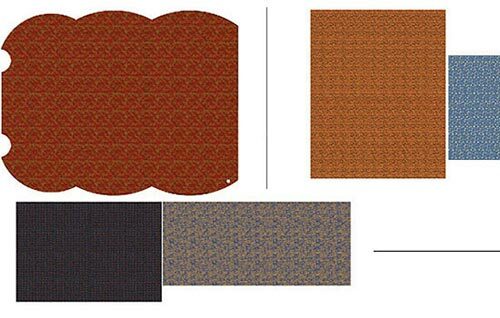 The carpet patterns were scaled to a "plan view" template and laid out in their correct positions. Then the entire deck flooring was distorted into perspective using Adobe Photoshop's "Free Transform" tool. 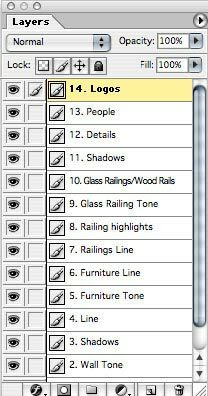 The final painting phase resulted in a Photoshop file with 29 paint layers and 6 line layers with a file size of 988 mb. This was merged down to a more manageable 14 layers for delivery to the client. For more information on mechanical and technical drawing techniques, please visit the Adobe Photoshop & Illustrator Tutorials section. 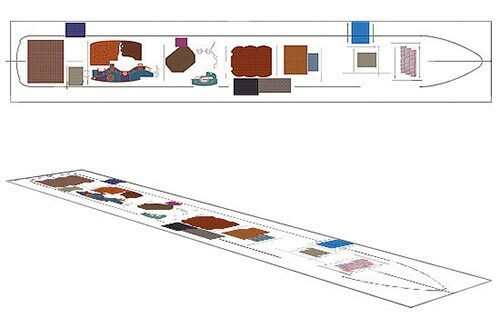 Many people will ask: why not use a CAD program to create an illustration such as this? Although CAD is a powerful tool to create and render 3 dimensional objects, it has inherent limitations that would make it impractical to use on an illustration of this scale and complexity. Before we begin this Photoshop painting lesson it is important to have a cursory understanding of color theory. We will be working exclusively in CMYK and not in RGB. Although there may be many good reasons to work in RGB (web graphics only, smaller file size, etc. ), for our purposes, CMYK (A.K.A. Subtractive Color) is a better choice. A "Ghosted", "Phantom View", "Transparent", or "See Through" technical illustration is one that renders the exterior skin of an object transparent in order to see the interior workings. A Ghosted illustration will be slightly more time consuming and expensive to create than a Cutaway Illustration. Ghosting an object requires completion of the entire outside AND inside of the subject before the fading or "ghosting" process takes place. The decision to ghost or cutaway a subject is a stylistic one. Although more internal information may be visible in a cutaway version, a ghosted illustration will favor the exterior of the subject which may contain important components, body features, logos, etc. Also make sure to visit Kevin Hulsey's site, where you'll find more free tutorials and some really amazing and inspiring work!